Drill pipe is one of the necessary components to any drilling rig designed to extract oil or other liquid materials from the ground. The drill pipe is not used for extraction. Instead, the hollow tubes pump drilling fluids downward to the bit and back out again as needed to reduce friction and heat buildup. Drill pipe transferred drilling torque to drill bit for drilling under the oil well. It bears complicated strength subject to pulling, loading, pressing, torsion and bending. 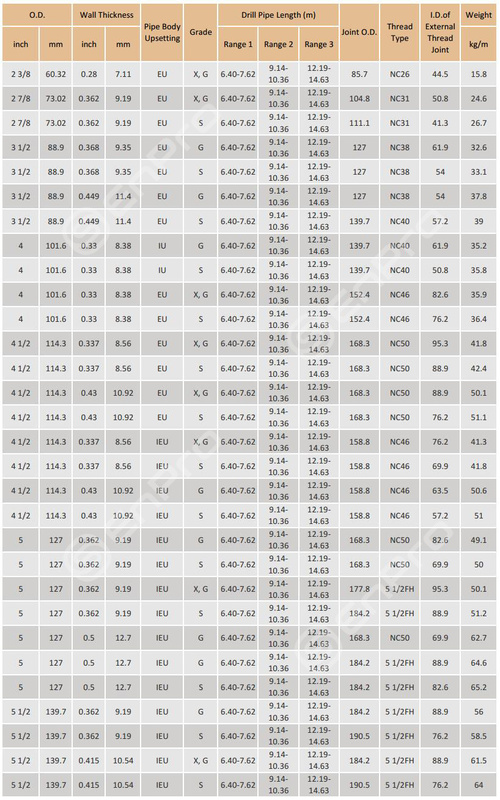 Connection threads: NC26, NC31, NC38, NC40, NC46, NC50, 5 1/2FH.6 5/8FH. The drilling tool is connected drill rod for transferring power. The drill string is usually part are: drill, drill collars, drill pipe, stabilizers, special connectors and Kelly. The basic role of the drill string are: (1)control the drill bit; (2) imposed WOB; (3) transmission of power; (4) transporting drilling fluid; (5) special operations: extrusion of cement, handling underground accidents. 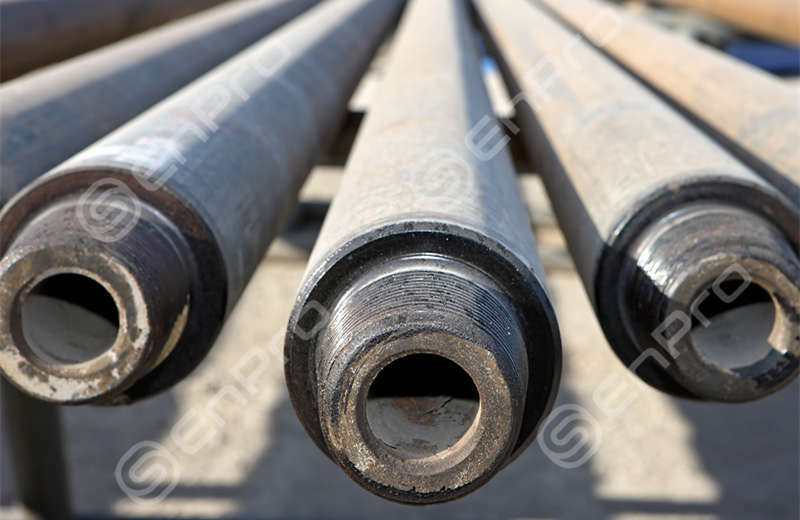 Drill pipe is trailing with screw thread for connecting the drilling rig located at the bottom of surface drilling equipment and mill equipment or bottom outlet device. The purpose is to drill the drilling mud delivered to the drill bit, and drill with the increase, decrease or rotating bottom outlet means. Drill pipe must be able to withstand great external pressure, twisting, bending and vibration. In the mining and oil and gas refining process, the drill pipe can be used multiple times. 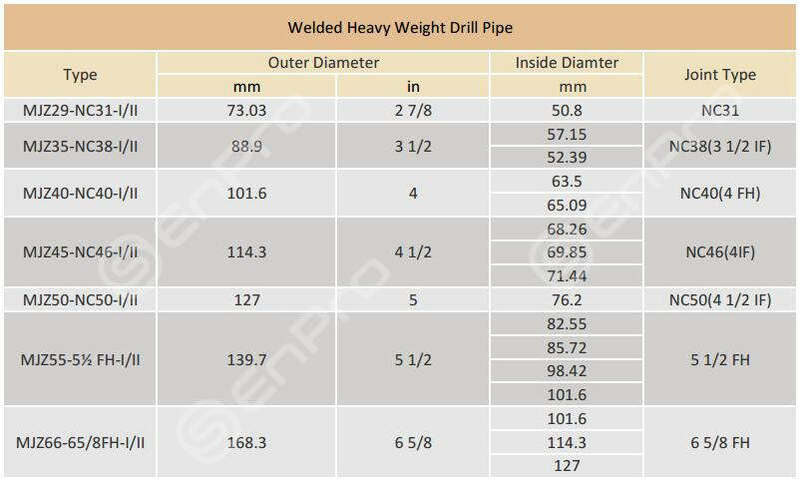 Heavy weight drill pipe is a medium-weight drill pipe, (referred standards in API SPEC 7-1). It has bigger wall thickness than common drill pipe and smaller than drill collar. The tube is connected with special length-added drill pipe joint (integral heavy weight drill pipe is made up of tube and tool joint). Among assemblies, it is generally added between drill pipe and drill collar to prevent sudden changes in cross-section of drill string, and reduce its fatigue. a. 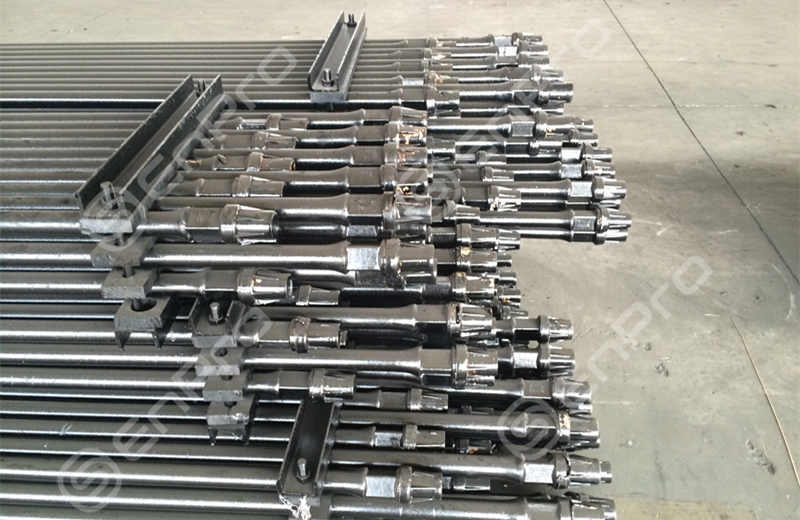 Heavy weight drill pipe could replace part of drill collar can reduce torque, improve load, and increase drilling capacity during deep well drilling. b. To pick-up sub and safety clamp that not used during drilling operation, which is easy to operate and can save tripping time. c. Drilling in high speed under low torque in directional wells and reduces the abrasion and fracture of string without differential pressure and sticking because of the lower steel grade than drill collar, small touching area with the well wall. Multiple drill stems are frequently attached together to reach the lowest point of the drilling project, which can measure several miles in depth. This practice makes various manufacturing details vital for the drill pipes to be useful and long-lasting. First, the metal must be strong enough to withstand both internal and external pressure differences, transfer the drill’s torque without affecting the pipe’s structure, and suspend the necessary components attached to its end. Ideally, the drill pipes are reused, especially the more expensive types. For exceptionally deep wells, tempered steel is the material of choice. After use at one drilling job, the pipe drill is transported to another site and given a full inspection. The main goal is to determine if the apparatus is still strong enough to use at future jobs before it is offered as a drill pipe for sale. Experts use various tools such as modified spherometers and ultrasonic metal testing gear to check for any weaknesses in the metal. The results of these tests give the drill pipe its classification. New, unused ones get the N designation, P is used for premium grade, and C1, C2, and C3 based on various stages of wear. After a pipe gets lower than a C3 score, a red band signifies it as scrap metal. As the drill pipe is only part of the complete apparatus needed for these types of drilling jobs, the bottom hole assembly also needs to be inspected. This BHA is a tube-shaped piece near the drill bit that is crafted of heavier and stronger metal. Pipe drills for sale do not start out as solid metal sheets rolled into tubes. Instead, three pieces are welded together to form the entire apparatus. These include the tube itself, the box tool joint, and the pin tool joint. The manufacturing company starts with base tubes of steel or aluminum. The tube ends undergo processes to rough up the metal in order to make tighter bonds. This process is called upsetting and can be done internally, externally, or at cross sections. 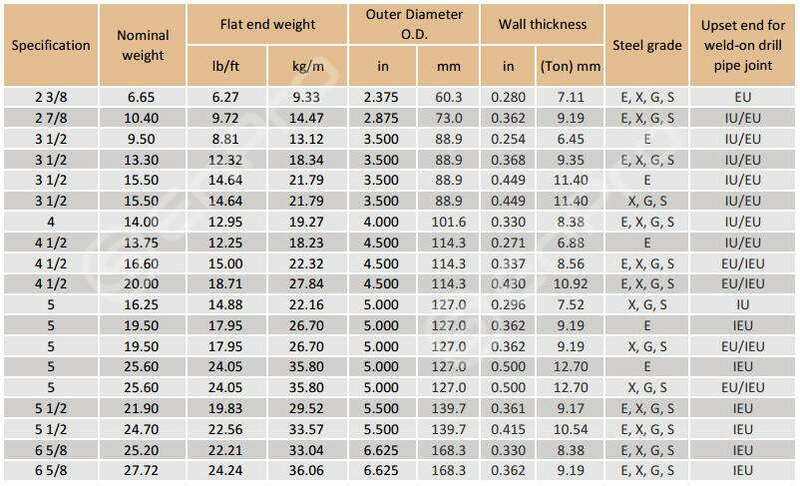 Different manufacturers use different types and sizes of steel pipe upset. 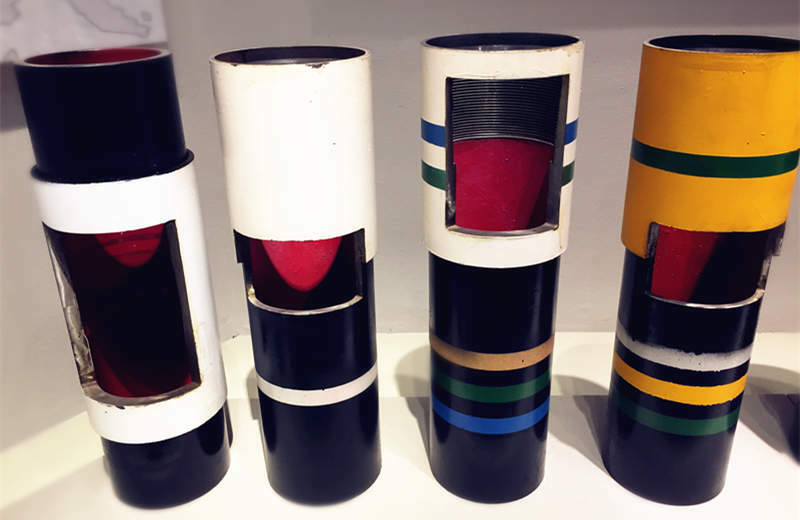 Finally, the pipes are heat treated to achieve proper strength. All necessary pipe drill connectors and joint pieces undergo similar treatments at the manufacturing plant. Connectors are transformed into female or male box or pin threaded ends. In the finished pipe assembly, the connectors at joints represent the most likely point of damage or failure. This is due to the lower temperature tempering, and the additional stiffness or brittleness of the metal. The stronger the steel, the more brittle it is, so manufacturing plants use precise measurements to avoid failure during the drilling process. 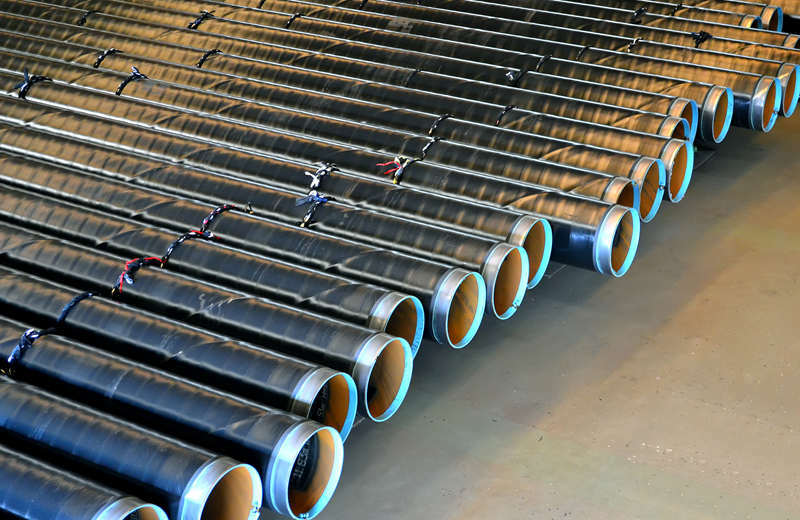 When you need drill pipe for your company’s drilling needs, understanding the different steps of the manufacturing process can bring you the best possible outcome on site. A trusted source follows the best practices for choosing and tempering metals, upsetting connective ends, and building joints and connectors that stand strong under pressure. We are offering Drill Pipe and Heavy Weight Drill Pipe. 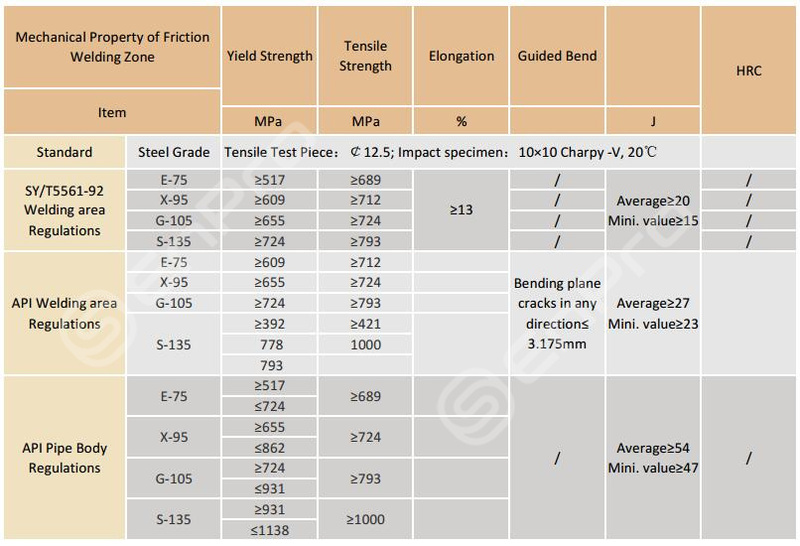 With sizes from 2 3/8 to 6 5/8, material grades E-75, X-95, G105, S135, threads type in NC26, NC31, NC38, NC40, CN46, NC50.